CHICAGO – It gives us tremendous pride to offer you this Hookup, but not just because it’s a killer giveaway. It’s not just because we’ve arranged for 75 pairs of you to hopscotch to the front of the line for the advance screening of one of the summer’s most-anticipated blockbuster films. It’s not just because our winners will be seeing “Terminator Genisys” in IMAX. And it’s not just because we’ll be giving away very unique digital “Terminator” T-shirts with an interactive eye that blinks. It’s because this “Terminator Genisys” event coincides with our own rebirth, which we’ve aptly been calling HollywoodChicago.com Genesis. It’s the culmination of years of work and endless passion for entertainment. To usher in the return of the hugely successful “Terminator” franchise that collectively has grossed $1.4 billion worldwide from four films and two more already on the way after this one, we’re also returning to our roots of innovation and pushing the envelope. This screening on Monday, June 29, 2015 at 7 p.m. at Navy Pier IMAX truly will be an event to remember. We’ll be taking the microphone before and after the show and we’ll present a distinguished panel of accredited, professional film critics to discuss the franchise. There will be trivia and prizes awarded for correct answers. Our winners will need to stay after the screening for our 45-minute panel and prizes. On top of it all, we’ll reveal our new Web site for the first time on the huge IMAX screen! We’re tearing down the current HollywoodChicago.com. Behind the scenes, we’ve been working hard to migrate our thousands of original articles since 2007 into a beautiful new, fully mobile-friendly daily everything entertainment publication. We’re also launching a professionally produced podcast on film called Press Play with more accredited critics in Chicago than any other podcast. And we’re launching Press Start, which will be the first regular podcast in Chicago on video games. To fund it all, we’ve recently launched an Indiegogo crowdfunding campaign that you can donate to now! We’ve pooled together great perks for donors from local entertainment venues. On Monday at this event, we’ll even have “Skynet” involved in an artificially intelligent way. After skipping the long IMAX line, you’ll get a code to text on your phone. Once the 125-minute film ends at 9:05 p.m., our founder, Adam Fendelman, will moderate the panel and engage you with trivia. All the while, Big Brother will be crunching numbers and phones will be texted at exactly 9:30 p.m. They’ll be the winners of our digital shirts and other prizes. So without further ado, here’s the rest of stuff you need to know about the film so you can get on with it and enter to win! 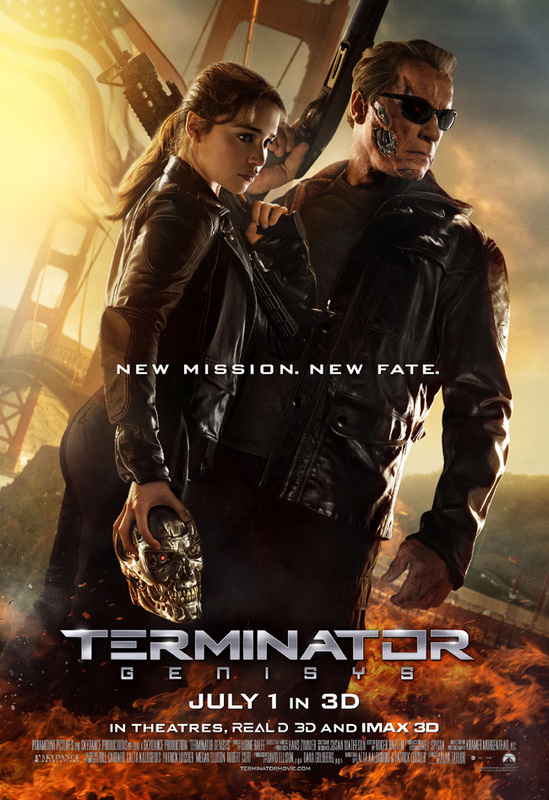 “Terminator Genisys” opens on July 1, 2015 and is rated “PG-13”. The film again stars Arnold Schwarzenegger with Emilia Clarke, Jai Courtney, Jason Clarke, J.K. Simmons, Courtney B. Vance, Dayo Okeniyi, Matt Smith and Byung-hun Lee from director Alan Taylor and writers Laeta Kalogridis and Patrick Lussier. To win your free, front-of-the-line passes to “Terminator Genisys” courtesy of HollywoodChicago.com, just get interactive with our social media widget below. That’s it! The more social actions you complete, the more points you score and the higher yours odds of winning! Completing these social actions only increases your odds of winning; this doesn’t intensify your competition! Preferably, use your computer to enter rather than your smartphone. If you must enter on your smartphone, click “Go to Full Site” at the bottom of the page. If viewing this page on your computer, make sure you allow pop-ups. Deadline: Entries can continue being submitted through Sunday, June 28, 2015 at noon CST. These Hookup winners will be awarded via e-mail that night. If necessary: To see your entry count on a repeat visit, submit your name and e-mail again. If you have trouble submitting your entry below, please e-mail Adam Fendelman. When John Connor, leader of the human resistance, sends Sgt. Kyle Reese back to 1984 to protect Sarah Connor and safeguard the future, a sudden turn of events creates a fractured timeline. Sgt. Reese finds himself in a new and unfamiliar version of the past where he is faced with unlikely allies, dangerous new enemies and an unexpected new mission. The movie poster for “Terminator Genisys” starring Arnold Schwarzenegger, Emilia Clarke and Jai Courtney. This HollywoodChicago.com Hookup is simple! Just get interactive in our social media widget above. We will award 75 admit-two, front-of-the-line movie tickets based on social entry numbers and/or randomly via e-mail for our “Terminator Genisys” Hookup. Good luck! HollywoodChicago.com works hard to coordinate our giveaways for you with the movie studios. If you enter to win and are fortunate enough to be awarded, we expect you to attend. If you reply saying you can’t attend – or don’t show up at all without notifying us – that opportunity goes to waste and another lucky HollywoodChicago.com winner misses out on enjoying what you would have. We use various forms of tracking technologies to know whether or not you attended. When you win and don’t attend, reputation points will be counted against you and you’ll win less frequently. If you enter to win, please make sure you can attend if you do win. Thank you. Your entry in this Hookup warrants your understanding of and agreement with these terms. HollywoodChicago.com winners must arrive early as seats are consumed on a first-come, first-served basis. Showings may be overbooked to ensure a full house, so winners are not guaranteed entry and must arrive early. We recommend arriving at least 60 minutes before the showing’s scheduled start time. Make-goods issued by the studio or its publicists are not guaranteed if you are declined entry for any reason. Per the studio’s discretion, phones and other recording devices may be required to be bagged and tagged for anti-piracy reasons during the screening. HollywoodChicago.com LLC is a promotional partner with the studio and its partners and does not assume any liability for this giveaway. HollywoodChicago.com is not responsible for errors or omissions entered in user submissions. Comments are closed in this Hookup.